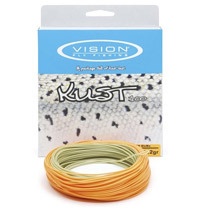 The original Kust line has a 10m slow intermediate head (pale olive) and 20m of floating running line (orange) to get your fly just under the surface, which is ideal in windy conditions. The line has a slick and supple coating which remains memory free, even in cold conditions. The slickness is achieved by adding Teflon® particles to the coating and this way the slickness does not wear off. The low stretch core helps you to feel the takes, it also transfers casting energy far more efficiently than traditional cores. The readymade loop makes it easy to attach the leader. For this season Vision introduce another Kust line, which has a sink type 2 head and a floating running line. 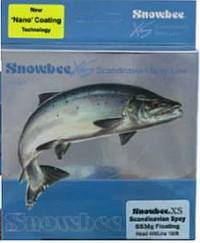 The faster sinking head (brown) reaches the correct depth quicker when needed and is also good when you're fishing from a drifting boat. It has a 10m head for easy casting and gives nice presentation even in the most challenging conditions. The memory free, slick and supple coating lays straight on the surface and the low stretch core helps you to feel even the most subtle of takes. This line also includes a readymade loop.